QUOTE: "Miss Allison? You're supposed to be asleep." 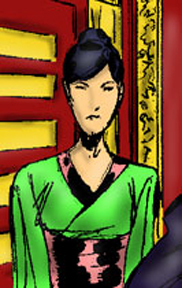 Gretchen serves as personal assistant to the textile mogul Harbinger. Mostly, Gretchen spends her time looking after Harbinger's ward, Allison Phoenix (daughter of Theron Phoenix, the thief known as Vertex). Gretchen's reserve is matched only by her patience. Over the years, she has grown to love 'Miss Allison', and cares for her as she would her own family. What she would like more than anything, is for Theron to notice her. Gretchen has had a secret crush on Theron for years. She's careful not to let her feelings show in front of Theron, and definitely not in front of Harbinger. She'll just do what she always does. Smile... and wait.